Tahir Ahmad Wani, 35, a tailor by profession, is one of the most sought after persons in Shopian. His small shop located in the main market remains filled with bemused youngsters. He is their new hero. But the fan following that Tahir enjoys among youngsters has nothing to do with his tailoring skills! It is his knowledge of an ancient martial art called Sqay that has made him famous. Sqay, is a martial art that finds its roots in ancient Kashmir. The art was quite popular in Kashmir before it started to decline in post colonial era. After 1947, given the changing political scenario in the region, Sqay got sidelined for a long time. Fearing its total extinction from the region Sqay grandmaster Nazir Ahmad Mir introduced modern competitions inspired by Taekwando and Karate during 1980s. And Tahir is keeping Mir’s tradition alive by training youngsters from Shopian town in this modified version of Sqay. Tahir was introduced to the art by Shaheen Ghulam Nabi Dar in 1998. Dar had come to Shopian and started teaching youngsters Sqay. “He used to take regular evening classes inside Higher Secondary School Shopian campus,” recalls Tahir. After Dar left Shopian Tahir took over as instructor and continued the classes on his own. “Initially the response was good. But with time attendance started to decrease as youngsters were more interested in cricket,” says Tahir. But since then things have improved a lot and Tahir is running a full-fledged academy from the same school ground teaching Sqay skills to hundreds of boys and girls every year. In January 2015, four boys from the Tahir’s academy were selected to represent India in 1st tri-nation International Championship held in Bhutan. The event was organised by Sqay Federation of Bhutan. Among them Rasikh Ashraf Lone, a 5th standard student won a gold medal while Mehran Nasir, Aafaq Abass, Suhail Ahmad Teli won a silver each. “Our efforts have finally paid off. Look at the kind of recognition these youngsters are getting on international platforms,” says Tahir proudly. But at the same time Tahir rues that successive governments have failed to help this art survive. “We are not asking for moon. We just need proper funding and a dedicated space to practice,” says Tahir. The 50 per cent of Bhutan trip expenses were borne by these kids themselves. “The rest of 50 per cent came from local businessmen who voluntarily funded us,” says Tahir. “Government spends millions of rupees on a game like Cricket which has foreign origin. While Sqay, that has Kashmiri origin, is being neglected by the authorities,” says Rasikh Ashraf who won a gold medal in Bhutan. Before Bhutan trip Tahir’s students represented J&K at the 15th national level Sqay Championship in Mysore. 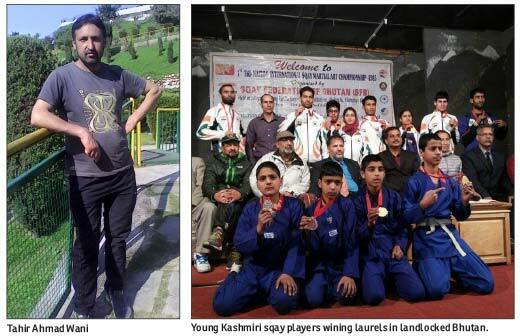 Out of 6 gold medals which J&K won, four were won by Tahir’s students. Later on these four students got selected for the international event. After the success of Tahir’s students internationally there is a sudden rush in enrolments in his academy. A few schools in district Shopian have also introduced Sqay for their students. “Government should take serious note to promote this game at school level so that talented youth of valley could get a chance to prove their worth,” feels Aafaq Abass, another award winning student of Tahir. The popularity of Sqay among young girls and boys in Shopian has come as a bit of surprise even for Tahir. Presently Tahir trains about 50 boys and girls at his academy that is still run from the grounds of Higher Secondary School Shopian. He does not charge any fee from them. “If a sports person like Tahir gets adequate facilities from govt more talented youth of our society could make us proud,” feels Nazir Ahmad, a local businessman. “Whenever any youngster comes for admission the first thing I tell him to continue with the studies,” says Tahir who dropped out of school after passing 8th standard. “Had I got proper platform and exposure I might have been an internationally recognized Sqay player right now,” feels Tahir. Now Tahir wants to realise his dream by training his two daughters Afreen and Arbeen. But the journey has not been always as smooth as it is after the success of these four kids internationally. During practice sessions or mock competitions Tahir and his students would yell words like: Haaya, Eech, Nee, Sun, Shiee (in Chinese language). “People started calling us by these names to tease us. It was very disturbing at times,” recalls Tahir. But Tahir and his team never got discouraged by such acts, rather worked their way to became local heroes. “There are some local businessmen who sponsor my students whenever there is any competition outside the state. I have never got anything from the government,” says Tahir. Tahir’s shop remains filled with students who come to him seeking advice in order to enhance their Sqay skills. But Tahir never complains. “Though my work gets disturbed but I cannot say no to anybody. I want these youngsters to live their dreams and mine too,” says Tahir.